Rivaling Gold in Color and Value! Crocus sativus comes from the Greek world "krokos", which means yellow in color, and the Latin world "sativus", meaning cultivated. Crocus sativus or better known as saffron, is an extremely interesting plant considering how valuable it is in today's world. 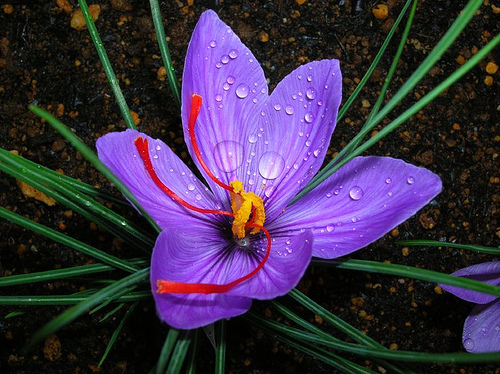 Its price rivals the price of gold, costing up to $315 per ounce to $5,040 per pound of saffron. This spice is so costly due to the struggle and effort of cultivation since the spice comes from only the three stigmas present in the flower of the plant. Also it is revered for its luxurious taste (found in Mediterranean and Middle Eastern food), pleasant aroma sometimes used as perfume, beautiful color seen in the dyes it produces, and its many medical benefits. Crocus sativus is an amazing spice that is used throughout the world for many purposes by many organisms. With its many benefits, adaptations, and interactions, there is no question why saffron has grown to be the most expensive and revered spice in the world. In order to learn about the phylogeny and classification of Crocus sativus, go to Classification. This webpage only shows one of many organisms that are featured in a larger work that can be found on MultipleOrganisms.net. The Multiple Organisms website is a culmination of various organisms that were compiled by UW-La Crosse students enrolled in Organismal Biology (BIO203).